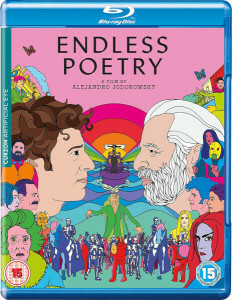 Legendary cult filmmaker Alejandro Jodorowsky (The Holy Mountain, El Topo) reimagines his youth spent as an aspiring poet in the surreal and breathlessly inventive Endless Poetry. In 1940s Santiago de Chile, 20-year-old “Alejandrito” Jodorowsky vows to become a poet against the will of his disciplinarian father. Leaving home, he is introduced to the inner circle of the artistic and intellectual avant-garde of the time, meeting Enrique Lihn, Stella Diaz, Nicanor Parra and many other promising young writers who will become the masters of Latin America’s modern literature. Immersed in a world of poetic experimentation, they live together as few have dared to live before: sensually, authentically, freely, madly. Continuing the autobiographical exploration begun in The Dance of Reality, Endless Poetry is a euphoric and unadulterated portrayal of artistic exuberance told through Jodorowsky’s dreamlike and kaleidoscopic visual language. To celebrate its release, we have 2 x Blu-ray copies to giveaway! In which film did Jodorowsky begin his visual autobiography?